Campbell River – Many Campbell River locals may not know that there is an aquatic health research laboratory located in downtown Campbell River. The BC Centre for Aquatic Health Sciences would like to change that. 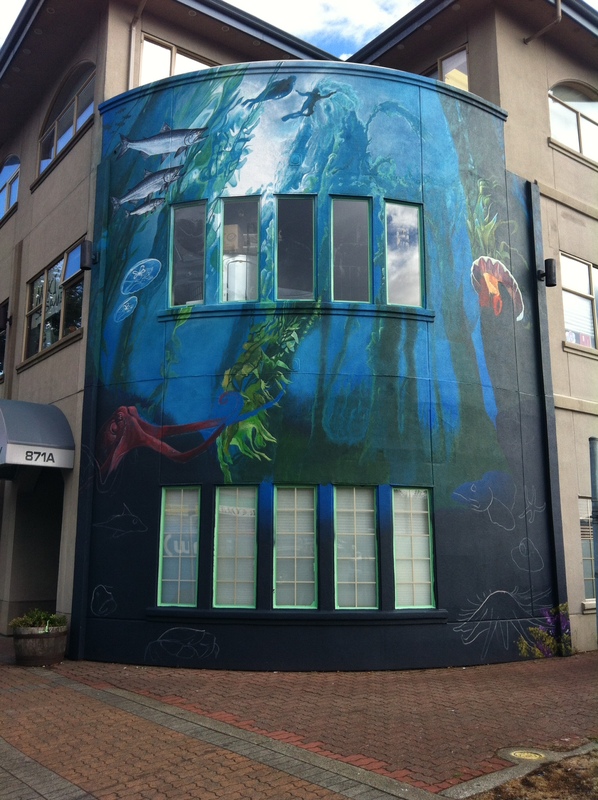 The BC Centre for Aquatic Health Sciences (BC CAHS) is thrilled to announce that funding has been secured for the painting of the Discovery Passage Mural in downtown Campbell River. When complete, the 550 sqft mural will span the curved wall of the building at 871 Island Highway located along Pier Street. BC CAHS’s laboratory has been located on the main floor of the building since 2008. Being a most prominent façade at the entrance to the Campbell River Downtown, the Discovery Passage Mural would add immeasurably to a visitor’s impression of the city known as the “Salmon Capital of the World” and also would make this building a welcome landmark in the city. The theme and subject of the mural would certainly strengthen and bolster the presence of the docks, Maritime Heritage Centre and the Discovery Passage Aquarium. The mural will tie into the local neighbourhood design and the existing mural artwork that is already resident on Pier Street. J. Alex Witcombe & Nick Hutton-Jay of Flywheel Studios will be painting the mural over the next couple of weeks. J. Alex Witcombe’s artwork is already located around Campbell River. Last summer he completed the mural at Mussels & More Pottery. As well, his artwork is displayed at the Campbell River Spirit Square. BC CAHS is especially proud that their 2015 Downtown Façade Improvement Grant application was successful. Without this funding from the City of Campbell River, the existing funding for the mural would not be enough for the mural completion. Other funders of the Discovery Passage Mural include the Discovery Passage Sea Life Society, Grieg Seafood BC Ltd., Marine Harvest Canada, Pallan Group, Pier Street Association, Skretting North America and the general public. The Centre for Aquatic Health Sciences exists to advance understanding of British Columbia’s aquatic resources by addressing issues of aquatic animal health and welfare, production and aquatic food safety, thereby facilitating the economic, social and environmental sustainability of British Columbia’s aquatic based resource industries and increasing research and service capacity in rural and coastal communities. This entry was posted in BC CAHS in the news and tagged BCCAHS, Campbell River, Campbell River Spirit Square, Centre for Aquatic Health Scien, City of Campbell River, Discovery Passage, Discovery Passage Aquarium, Discovery Passage Mural, Downtown Façade Improvement Grant, Dr. Jim Powell, Flywheel Studios, Grieg Seafood BC, J. Alex Witcombe, Marine Harvest Canada, Maritime Heritage Centre, Mussels & More Pottery, Nick Hutton-Jay, Pallan Group, Pier Street, Pier Street Association, Salmon Capital of the World, Skretting North America. Bookmark the permalink.